R.A. THE RUGGED MAN CHAINS (FEATURING KILLAH PRIEST & MASTA KILLA) LYRICS"
Son of the morning, roasted souls, tell Minister "come pray"
All R.A. 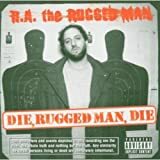 The Rugged Man - Chains (featuring Killah Priest & Masta Killa) lyrics are property and © copyright of their respective owners. All Chains (featuring Killah Priest & Masta Killa) lyrics provided for educational purposes only.